Lateral ligament injuries or inversion injuries are perhaps one of the most common sporting injuries seen by physiotherapists, especially in jumping sports (e.g. basketball, volleyball). They are usually a result of a forced plantar flexion/inversion movement, whereby the complex of ligaments on the lateral side of the ankle is torn by varying degrees. Inversion injuries are also far more common than eversion injuries due to the relative instability of the lateral joint and weakness of the lateral ligaments compared to the medial ligament. Although the sprained ankle is a relatively benign injury, they are not always well managed. Inadequate rehabilitation can lead to a chronically painful ankle, reduced functional ability and increased likelihood of re-injury. Care should also be taken to avoid missing the less common causes of ankle pain, namely; small fractures around the ankle and foot (e.g. Pott's fracture) and straining or rupture of the muscles around the ankle (e.g. calf, peroneii, tibialis anterior). The ankle contains three joints. The talocrural joint or ankle joint is a hinge joint formed between the inferior surface of the tibia and the superior surface of the talus. The medial and lateral malleoli provide additional articulations and stability to the ankle joint. The inferior tibiofibular joint is formed by the articulation of the distal parts of the fibula and tibia. The inferior tibiofibular joint is supported by the tibiofibular ligaments or syndesmosis. The subtalar joint between the talus and calcaneus is divided into an anterior and posterior articulation separated by the sinus tarsi. 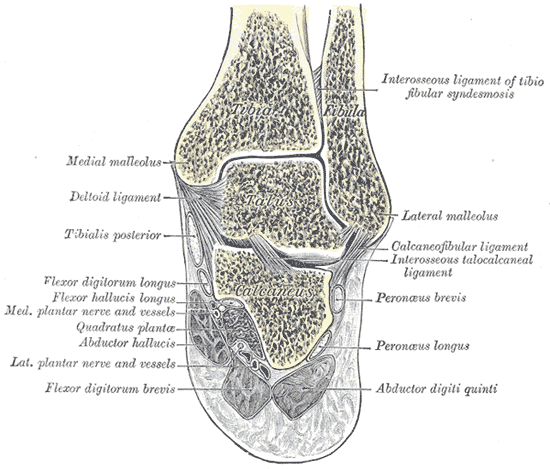 The lateral ligament consists of three parts: the anterior talofibular ligament which passes as a flat band from the tip of the fibula anteriorly to the lateral talar neck; the calcaneofibular ligament, which is a cordlike structure directed somewhat posteriorly; and the posterior talofibular ligament, which runs posteriorly from the fibula to the talus. A Pott’s fracture is a fracture affecting one or both of the malleoli. During activities such as landing from a jump (volleyball, basketball) or when rolling an ankle, a certain amount of stress is placed on the tibia and fibula and the ankle joint. When this stress is traumatic, and beyond what the bone can withstand, a break in the medial, lateral or posterior malleolus may occur. Also activities involving a sudden change of direction, such as football and rugby, can cause fractures around the malleoli. When this happens this condition is known as a Pott's fracture. A Pott's fracture often occurs in combination with other injuries such as an inversion injury, a dislocation of the ankle or other fractures of the foot, ankle or lower leg. Pott's fractures can vary in location, severity and type including displaced fractures, un-displaced fractures, bimalleolar fractures or compound fractures. It can be difficult to distinguish clinically between a fracture and a moderate to severe ligament sprain. Both conditions may result from inversion injuries, with severe pain and varying degrees of swelling and disability. Patients with a Pott's fracture typically experience a sudden sharp and intense pain around the ankle or lower leg immediately at the time of injury. The pain is situated at the front, back, inner or outer part of the ankle or lower leg. The patient may have heard a “crack” as well. Due to the pain the patient limps to protect the injury. In severe cases weight bearing may be impossible. Patients with a Pott's fracture usually experience swelling, bruising and pain on firmly touching the affected region of bone. Pain may also increase during certain movements of the foot or ankle or when attempting to stand or walk. When it is a displaced fracture, an obvious deformity may be noticeable. One of the most important components of rehabilitation following a Pott's fracture is that the patient rests sufficiently from any activity that increases their pain. Activities which place large amounts of stress through the ankle should also be avoided, particularly excessive weight bearing activity such as running, jumping, standing or walking. Displaced Pott’s fractures where the anatomical relationship of the bones of the ankle has been disrupted need to be surgical fixed. This may be followed by the use of a protective boot, brace, or a plaster cast, and/or crutches for a number of weeks. Fractures that are not displaced, treatment may involve a plaster cast immobilization and the use of crutches, followed by the use of a protective boot or brace for a number of weeks. Patients with a Pott's fracture should perform pain-free flexibility, strengthening and balance exercises as part of their rehabilitation to ensure an optimal outcome. The physiotherapist may utilize techniques such as massage and joint mobilization which is essential to ensure optimal range of movement and flexibility. The aim of massage is to fight the formation of heterotopic ossification. This is the process by which bone tissue forms outside of the skeleton. The treatment may also involve electrotherapy, taping and bracing, exercises to improve strength, flexibility and balance, and hydrotherapy. Lengthening of the tendon Achilles is proved to be a treatment for complicated Pott’s fractures. Lengthening or stretching of this tendon can be done by performing a passive dorsiflexion of the foot while the leg/knee is straight. In the most severe cases of a Pott's fracture, patients usually make a full recovery with appropriate management. Return to activity or sport can usually take place in a number of weeks to months.